100% Natural Latex Sleep Pillows. Made in the USA! Botanical latex is 100% natural and not blended with any synthetics or petrochemicals. Our 100% Natural Latex Sleep pillows help support and align the neck & spine. Your head, neck, shoulders & back "sense" the support and relax so you enjoy a deep, restful night's sleep and awake feeling rejuvenated. -Does not harbor dust mites. -Organic cotton cover that is removable & washable. Dimensions: Trvl 12.5"x16", Std 20"x25", Med 20"x30", Lg 20"x36"
Don't forget to get a machine washable organic cotton pillow cover for this pillow. Add it to your order below. It's the best way to protect your pillow and you don't need to wash the pillow itself. The Organic cotton cover is removeable and washable. Wash with delicates on cold (or spot clean). Dry on Low or No Heat (or line dry) to reduce risk of shrinkage. Ordinary pillows don't properly support your head & neck which forces your neck into unnatural, potentially harmful positions. Sleeping in an unsupported manner can cause surrounding muscles in your neck & upper back to work harder which can result in a stiff, achy morning! 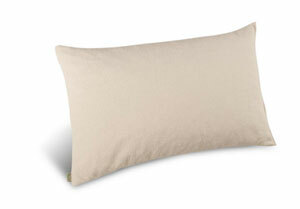 Our 100% Natural Latex Sleep pillows help support and align the neck and spine. Your head, neck, shoulders and back "sense" the support and relax so you enjoy a deep, restful night's sleep and awake feeling refreshed and rejuvenated. Botanical latex is naturally hypoallergenic and anti-bacterial. Botanical latex does not harbor dust mites. 100% botanical latex from the rubber tree - no polyeurathane foam blends or synthetics. Our latex is tapped directly from the rubber tree and whipped with air before being baked into pure 100% natural botanical latex.